Custom Billing Charges are customizations that you create in order to provide your own discounts or premiums to your end users. You have complete flexibility to apply customizations to numerous fields, such as accounts, services, usage types, tags, account families, etc. You can create recurring charges and you can choose if these charges will be based on the original unblended cost or on the calculated List cost. Click the buttons to learn more about each option. This is strictly a percentage-based discount (-) or premium (+) that can be applied to any subset of costs within your family of billing items. When you use this custom charge type, the customization is automatically applied real-time on List Cost billing data. Only you. Your customers will not see or get any record of these charges. Description: Enter a description for this charge. This is only visible within this Custom Billing Charge menu so you can keep track of all of your customizations. Example: General 5% premium on all charges. Percentage of discount or premium: Enter in the percentage premium (a positive number) or the discount (a negative number) that you want. Example: A discount of 50% would be -50. Apply percentage to: In this section, you will choose to apply this customization to either Unblended Cost or List Cost. Unblended Cost is the amount billed by (or paid to) AWS. If you apply the customization to Unblended Cost, you are effectively changing the calculation of your own costs. List Cost is the amount the customer should be billed, based on what services they use and any agreed upon charges. In an MSP/Reseller model, you would select List Cost so the customer's personalized costs get altered (as opposed to your true cost from AWS). Start/End Date: You must choose a start date. If you want the charges to continue indefinitely, do not choose an end date. If the start date is any date in the past, you will need to reload the DBR for the months that you want affected. Example use case: You want to charge your customers a 3% premium across the board as a starting point. Enter a description (EX: Standard 3% Premium). Enter a percentage (EX: 3). Apply percentage to List Cost. Type a start date and leave the end date blank. Click Save Custom Charge. CloudCheckr saves your charge and displays it in your list of custom billing charges. 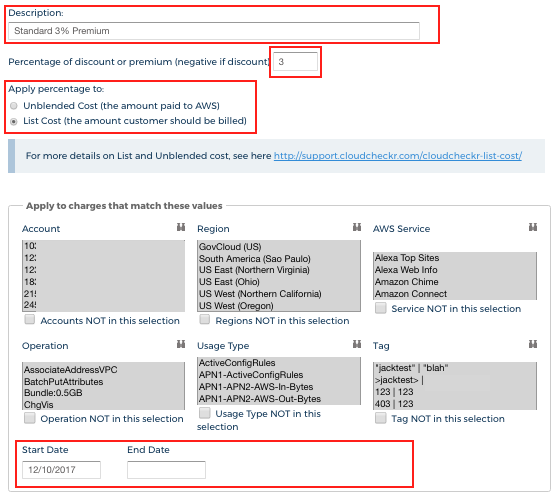 You can add a customer-visible custom charge that affects AWS accounts or services of your choice. CloudCheckr computes and adds the charge as a single line item in your customer's list cost data when the billing month is closed. Both you and your customers will see the charge as a single line item under List Cost. Description: Enter a description for this charge. This will be visible to both you and your customers as a single line item under List Cost. Example: 5% discount on EC2 services. Percentage of credit or charge (negative if credit): Enter in the percentage credit (a positive number) or the charge (a negative number) that you want. 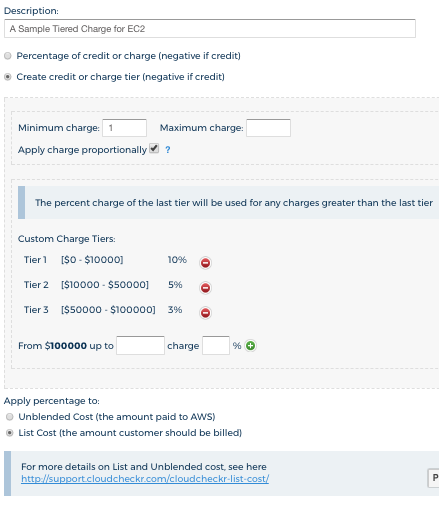 Create credit or charge tier (negative if credit): Select this option to create tiered charges for your customers. Apply charge proportionally: When enabled, this gives you the ability to select multiple accounts with the option to group the accounts together, and pass those through the tiers. For example, if account A is $5 and account B is $95, CloudCheckr will calculate the custom charge based on $100 and when it applies that custom charge to the accounts, account A will get 5% of the charge, and account B will get 95%. In this scenario, CloudCheckr will evaluate the charge tier based on the total consumption over a group of accounts. When this feature is disabled, each account's spend is evaluated independently and charged a percentage. Custom Charge Tiers: Enter in the dollar limits for the tier and percentage charge for the tier. Click the green plus icon to add additional tiers. Custom charge stacking and ordering: When enabled and given a number, allows you to choose the order (i.e. 'stack') in which your custom billing charges will take effect. For example, you might want to give a 5% charge on everything before you then add another premium on only support charges. Example use case: You want to create a tiered charge for three specific accounts that goes down in percentage the more that your customer spends. 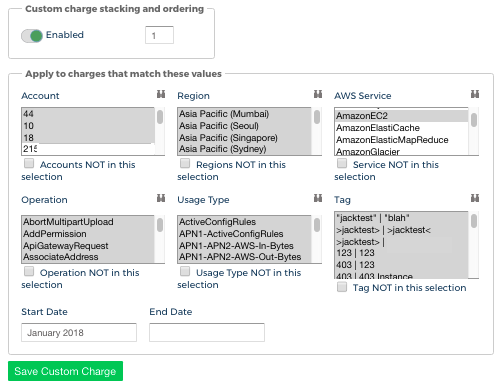 Enter a description (EX: A Sample Tiered Charge for EC2). Select Create credit or charge tier (negative if credit). The tiered charges menu opens. Enter a minimum charge and a maximum charge. In our example, the minimum is 1 and since we don't want a maximum, we have left that field blank. Click to enable Apply Charge Proportionately. Create Tier 1 from 0-10000 at 10%. Click the green plus icon to add the tier. Create Tier 2 from 10000-50000 at 5%. Click the green plus icon to add the tier. Create Tier 2 from 50000-100000 at 3%. This will be our last tier. Any charges more than $100,000 will continue to have a 3% charge. Enable Custom charge stacking and ordering and enter 1 for the stack order. Ensure the Start Date is entered. Leave the End Date blank. Under Apply to charges that match these values, select your desired Accounts, and select AWS Service: EC2. Click Save Custom Charge. Your charge is saved and displays in your list of custom billing charges. You can add a charge or credit that is a fixed amount that can occur once or repeatedly, such as a custom charge of $500 every month for extra services you provide around security. Amount: The amount of the fixed charge. One time vs Monthly recurring: Determines if this will be a one time charge or a monthly recurring charge. Description: Enter a description for this charge. This will be visible to you and your customers as a single line item under List Cost. Apply to charges that match these values: Select any accounts that will receive the monthly charge. 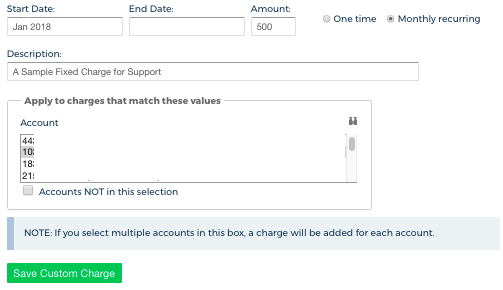 If multiple accounts are selected, a single charge will be created for each account. Example use case: You want to create monthly recurring fixed charge of $500 for extra support given to your end users. Add a Start Date. Leave the End Date blank because we want this charge continue indefinitely. Enter a Description. For this example, we used A Sample Fixed Charge for Support. Under Apply to charges that match these values, select the accounts desired. After you save your custom charge or if you want to modify an existing custom charge, go to the Custom Billing Charge screen where you can see all of your charge's details. The table identifies each UI component associated with the custom billing charges. Click to display the List Cost Analysis page. Click to display the selected custom charge and modify it. Click to duplicate the selected custom charge. Indicates the date when the software will begin to apply the custom charge. Indicates the date when the software will stop applying the custom charge. Identifies the type of custom charge you configured: percent discount or premium; monthly percent or credit; or fixed charge or credit. Identifies value of the custom charge as a percentage, whole number, or tier. Identifies the unique account ID where the custom charge was applied. Summarizes the purpose of the custom charge for easy identification. Identifes the region(s) where the custom charge was applied. Identifes the unique account ID where the custom charge was applied. Identifes if the Stack option is enabled or disabled. Identifes where the custom charge falls within the stack order. As with any customization to your list cost, you will need to reload the DBR in order for changes to take effect. For more information on reloading the DBR, go here.